Congratulations on completing our first major event! 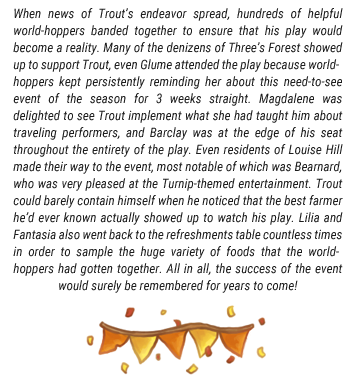 make Trout's play venture a resounding success! We would like to thank everyone for their diligence in testing out the mechanics of our first major event as well as our event feature's interface. Through all of your efforts and feedback, we've gained a lot of valuable information that we'll be taking note of for future events! Curious about some of the data that we gathered from the event? Here are some interesting stats from the community! 2745 users participated, resulting in 687 users qualifying for the Elite Carry-Over Prize! The community completed a total of 495921 tasks during the event! The event won't end as soon as the bar is filled, this gives everyone time to get to the tier they want if they plan ahead, and users won't be "taking away" points from others! There will be "overtime" stretch goals that unlock additional prizes after 100% is surpassed! This will add more to look forward to and strive for if the goal is reached early. Rankings for tied scores will be based on the user that achieves that score first. Currently it is ordered by ID#, but our coders have reassured us that ties are always "friendly" (both users are awarded the higher prize). There will be more story and art based things for event outcomes in the future! Additionally, we are working on a variety of new event types for the future! A collection based event where you collect points throughout the site in order to spend them at an event shop that opens up at the end of the event. A team-based event where you pick a team/side to earn points for and try to collectively acquire more total points than the other teams by the end of the event! A community based event where you earn points by interacting in some way with other users and spend the points on rewards afterward! Official side contests/raffles happening on the forums during seasonal events related to the event/season! Please visit the event page hub to view your prizes! A small note about carry-over prizes: Event trophies and the Spring Bloom item will be redistributed to accounts that qualified for these prizes after the Beta wipe, so they will be waiting for you on your account when you login again during official launch. If you weren't able to participate as much as you would've liked, don't worry! The seasonal nature of this event means that it and all of its associated prize items will return in official launch. With the event over, we are hard at work on implementing the 4th town update, as well as a test run of how the monthly chance machines might work. Stay tuned! Really excited about the changes planned for future events! I’m glad this was such a successful test run! This event was so fun!!! I'm excited to see how it'll be made even better in official launch as well as what other kinds of events will exist. Thank you guys for the speedy fix too! I'm pumped to go put together a new outfit. Nice! it was rough juggling full time job and this event but managed gold and top 25% which was beyond my goal of silver. Thanks staff! It makes me feel so much better abput this event that all the prizes will come back!! Congratulations everyone, and thanks for the staff for listening to all players feedback! Gz everyone. Glad we hit that 100% mark. Congrats everyone! I’m a little bummed the event ended when we reached the goal, I was hoping on that last day to finally reach 10k. Oh well, good job everyone! I liked this one as well but having different event types is more fun as you'll never know what kind of type you'll get next, or what to expect. Which is very exciting. Congrats everyone!! Thank you for all your hard work!! "676 Gold Tier users contributed 80%" how do you all have time for this lol. I work full time and got to bronze but jesus. Oh awesome! Congrats everyone! What a fun and a cute event! :D can’t wait for the next events to come, and based on this one, they should be just as entertaining! Congrats to those who got that carry over prize too! Thank you for this event & for listening to feedback. :) And the little story around it; about midway I forgot it's about Trout but the end result of making him happy made it worth it!